Ok, so here is our take – Microsoft is really stalling at this point. As our Alex Wilhelm pointed out on Tuesday, if there is going to a winner in the tablet market over the iPad, it will come from an Android device and not a Windows 7 device. Ballmer is probably hoping that people will just start turning to PCs that are basically screens that can be carried around to watch movies, but that the user docks to a workstation and then uses as a “real” PC. Otherwise, what he is saying here basically keeps Microsoft out of “the race” as they have no OS that works well as a pure tablet PC. 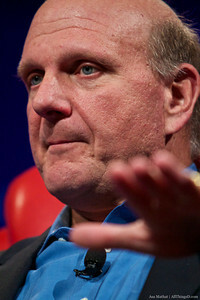 Image and h/t to CNET also h/t to people live tweeting the event, especially Loic.